Rediff.com » Movies » How well do you know Aamir? How well do you know Aamir? Aamir Khan is now 40 and has been in showbiz for nearly 20 years (More if you count his appearance as a 7-year-old in Yaadon Ki Baraat :-))). rediff.com dares you to take this Aamir quiz. Did you know? When the Aamir Khan-Juhi Chawla starrer Qayamat Se Qayamat Tak became a hit, distributors of the film in Mumbai, introduced a new strategy to boost its box office receipts booking further: Buy eight or more tickets and get a poster of Aamir and Juhi free. QSQT's collections showed an even bigger jump after that. 2. Which Shah Rukh Khan film was first offered to Aamir? Did you know? Aamir's former wife Reena Dutta lived in the building opposite where Aamir lived with his father, producer-director Tahir Hussain, and his mother. Their balconies faced each other! Aamir and his younger brother Faisal nicknamed their balcony Jannat ki pariyaan (Fairies in Heaven) because of all the beautiful girls in the neighbourhood. 3. In which year was Aamir awarded the Padma Shri? Did you know? Aamir openly breaches Bollywood protocol by doing just one movie at a time and refuses to sign a film unless he has the finished script in his hand before it goes on the floors. Besides, he never attends Bollywood award functions. 4. In 2002, on which international film festival jury was Aamir a member? Did you know? 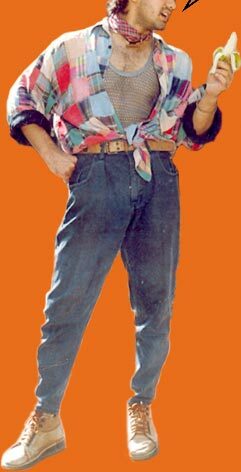 For Baazi, Aamir had to get his body waxed to dress as a woman. He then spent almost five hours every morning for eight consecutive days to become a lady. 5. On which Hollywood classic is the Aamir-Pooja Bhatt starrer Dil Hai Ki Maanta Nahin based? Did you know? Aamir Khan's favourite actors are Raghuvir Yadav, Om Puri, Naseeruddin Shah and Dilip Kumar. His favourite actresses are Waheeda Rehman, Geeta Bali, Madhubala and Sridevi. His favourite film of all time is Guru Dutt's Pyaasa. 6. Which of Aamir's films is based on On The Waterfront? Did you know? While in college, Aamir developed an interest in theatre and joined the theatre group Avantar, led by director Mahendra Joshi. He worked backstage and acted in two plays, the Gujarati Kesar Bina, and the English Clearing House. Did you know? While in college, Aamir had developed an interest in theatre and joined the theatre group Avantar, led by director Mahendra Joshi. 7. On which two films did Aamir assist his uncle, Nasir Hussain? Did you know? Aamir assisted Nasir Hussain -- whose son Mansoor Khan cast Aamir in Qayamat Se Qayamat Tak and Jo Jeeta Woh Sikandar -- for three years during the making of Manzil Manzil and Zabardast. He has always had a great interest in direction and is known for constantly giving his directors advice, solicited and unsolicited! He has always had a great interest in direction, and is known for constantly giving his directors advice, solicited and unsolicited! 8. In which film does Aamir play a character named Rahul (Malhotra), a name usually associated with Shah Rukh Khan? Did you know? On the sets of Lagaan, Aamir had to wake up early in order to finish breakfast before the morning's shooting began. His makeup took time -- his skin needed to be stained brown. Aamir decided he could get an extra half hour of sleep if he ignored breakfast and promptly started sleeping in! Aamir decided he could get an extra half hour of sleep if he ignored breakfast, and promptly started sleeping in! 9. What is Aamir's daughter's name? Did you know? After Baazi, pals Aamir and director Ashutosh Gowariker were unhappy with the results. The film was made keeping the box-office in mind, but it flopped. Aamir was sure of Ashu's skill and convinced him his next film must be one the director truly believed in! The result was Lagaan. 10. Other than Yaadon Ki Baraat, Aamir made another appearance as a child artiste. Which film was this? Did you know? Aamir's ex-wife Reena Dutta didn't have any interest in moviedom. After they married, she refused to read any film magazine and rarely attended filmi parties. One often spotted her taking a Mumbai local in 1988 to attend class in south Mumbai. Her interests lay in computer software, but Aamir's schedule forced Reena to take on the role of homemaker until she became executive producer on Lagaan. Without her discipline and focus, it is doubtful if Lagaan would have been made on such a budget and in such style! You can spot her in the memorable Papa Kehte Hain song from Qayamat Se Qayamat Tak. Movies Quiz is best viewed in Internet Explorer and Netscape above version 6.0.